Reading, writing and arithmetic. And don't forget competition. The world of education has changed and schools are competing more than ever for students, from kindergarten classrooms to college lecture halls. Education has always had a good story to tell, and Wheeler Creative Studios is thrilled to be working on those stories (and winning awards) for the good of the client and the good of the student. 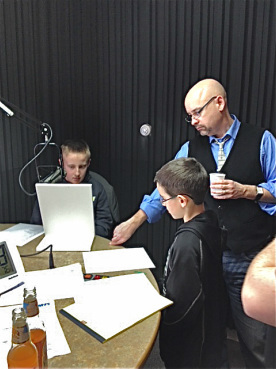 As part of a public school marketing strategy, Wheeler Creative Studios went into 6th grade classrooms to have the students write and produce promotional radio commercials about their school. "Tim Wheeler has helped us reach a specific demographic market, promoting early childhood services throughout Muskegon and Oceana counties in unique and exciting ways." ​Districts experience a loss of approximately $7,000 per year for each student that chooses a different school. Regaining those lost students was the focus of the Rocket City marketing strategy for Reeths-Puffer Schools. "I think Tim's strength is his ability to tell a story with warmth and humor in a way that appeals to a broad base of the population. That is a rare strength. His work doesn't follow the trends; it is unique and stands out." Flip Mulliner, Partner, Postworks, Inc.